From negotiating deals on behalf of top athletes to overseeing operations at a stadium, there are many ways to build a career behind the scenes of athletic teams and events. If you’re interested in sports and health leadership, you might be weighing your options for pursuing a graduate degree. A program in kinesiology is one way forward, but it’s important to choose the educational path that best fits your goals. When you consider the differences in completing a master’s in kinesiology vs. sport management, you’ll see how a curriculum that provides a comprehensive background in sports business and administration can give you an edge in reaching your professional objectives. Students who earn an online Master of Science in Sport Management develop the skills necessary to drive strategy in sports-oriented organizations and help athletes achieve success both on and off the field. Those interested in a master’s degree may have previously taken undergraduate courses exploring the science behind what makes an exercise program effective, best practices for preventing injuries, and techniques for promoting fitness. By completing a graduate program, professionals gain a deeper understanding of the theory behind their work and deepen their engagement with various approaches to health and fitness. Master’s programs might offer concentrations in areas of study such as human performance, biobehavioral science, and exercise physiology. Some of these specializations are intended for students who plan to pursue a doctorate or a career in research. That means the curriculum may involve a requirement to perform original research and write and defend a thesis. At the University of Florida, innovative research taking place in Center for Exercise Science shapes the curriculum for graduate students studying kinesiology. The scientists working in this multidisciplinary research center perform groundbreaking studies into the connections between physical activity, the functions of muscles and organs, and illness. Kinesiology graduate students have the chance to develop cutting-edge knowledge from working with renowned experts in areas such as cardiovascular physiology and rehabilitation neuroscience. Advanced studies in kinesiology may concentrate on the scientific and medical aspects of athletic events, but a graduate program in sport management explores issues related to business, leadership and marketing as well as athlete performance. While working toward an M.S. in Sport Management, professionals develop the skills, knowledge and experience necessary to perform administrative functions for teams, organize events, and guide athletes through a variety of challenges on and off the field. In a sport management curriculum, students become more informed financial and organizational decision makers with a thorough understanding of the legal concepts related to sports and player contracts. They analyze data to evaluate health and human performance and perform research to solve the types of problems that occur in sports organizations. Students have chances to explore how sports relate to broader social issues, investigate how psychological principles apply to athletics, and refine their personal leadership philosophies. 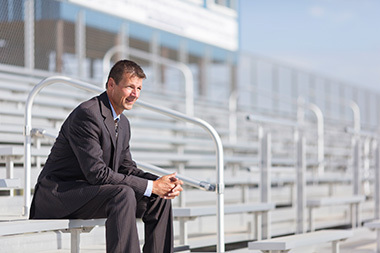 Athlete Development readies graduates to counsel players on striking a healthy balance between their physical performance and mental and financial well-being in positions like athletic director or director of player engagement. High Performance Coaching is intended for students who wish to pursue positions in managerial coaching or athletic administration, showing them how to foster the best performances in athletes. Sport Law teaches lawyers and administrators about legal principles that can have important applications in the world of athletics, including insurance, real estate finance, insurance, and fair competition. When you consider the differences in completing a master’s in kinesiology vs. sport management, you’ll see how a curriculum that provides a comprehensive background in sports business and administration can give you an edge in reaching your professional objectives. To learn more about the University of Florida’s online masters in sport management and download a free brochure, fill out the fields below. You can also call (877) 665-3860 to speak to one of our Academic Assistants about the program. The University of Florida respects your right to privacy. By submitting this form, you consent to receive emails and calls from a representative of the University of Florida, which may include the use of automated technology. Consent is needed to contact you, but is not a requirement to register or enroll. The Athlete Development specialization qualifies students to pursue certification through the Professional Association of Athlete Development Specialists (PAADS). © 2019 Online Master of Science in Sport Management.